We took the entry level Breville Cafe Roma for a little test drive and we were impressed with the quality and contents in the box. We took the entry level Breville Cafe Roma for a little test drive and we were impressed with the beverage quality and contents in the box. 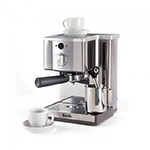 Breville's Cafe Roma features a stainless steel frame and a die cast metal top heating plate to keep the cups hot. A perfect starter machine! Easy to use, fast startup and a lovely compact size. It's an amazing value at $209.99. The brew temperature was right on. Works with ground coffee and E.S.E. pods. Even comes with a frothing pitcher and set of 2 espresso cups and saucers; it really does have everything! The 50mm pressurized filter baskets make it real easy for the novice to pull barista quality shots. The stainless steel steam wand creates perfect froth for cappuccino thanks to the air injector. This is for sure "Best Buy" in this price category.